Figures from the scientific community and beyond came together to mark the passing of famed physicist Stephen Hawking, who died, aged 76 on Wednesday, the same day as Albert Einstein's birthday, also known as "Pi day." The academic, author and noted scientist brought complex theories to a wide audience through his bestselling book, "A Brief History of Time." "He was a great scientist and an extraordinary man whose work and legacy will live on for many years," his three children, Lucy, Robert, and Tim, said in a joint statement. "His courage and persistence, with his brilliance and humor, inspired people across the world. He once said, 'It would not be much of a universe if it wasn't home to the people you love.' We will miss him forever." Neil deGrasse Tyson, another scientist who has made great strides in popularizing the discipline among the wider public, paid tribute to the Cambridge academic with a typically tongue-in-cheek physics joke. "His passing has left an intellectual vacuum in his wake," the astrophysicist wrote on Twitter. "But it's not empty. Think of it as a kind of vacuum energy permeating the fabric of spacetime that defies measure. Stephen Hawking, RIP 1942-2018." NASA's official Twitter account also marked his passing with a moving tribute. "Remembering Stephen Hawking, a renowned physicist and ambassador of science. His theories unlocked a universe of possibilities that we & the world are exploring," it said. World and industry leaders also noted his passing. India's Prime Minister, Nerandra Modi, tweeted his condolences. "Professor Stephen Hawking was an outstanding scientist and academic. His grit and tenacity inspired people all over the world. His demise is anguishing. Professor Hawking's pioneering work made our world a better place. May his soul rest in peace." Google CEO Sundar Pichai simply wrote: "The world has lost a beautiful mind and a brilliant scientist. RIP Stephen Hawking." 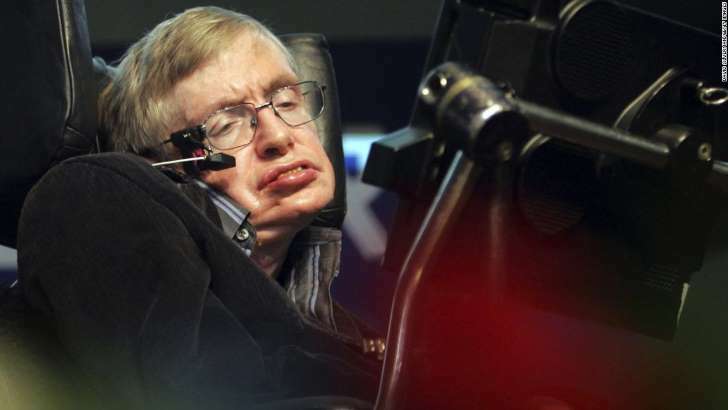 Hawking, who appeared on both "The Simpsons" and "Futurama," two Matt Groening animations which have regularly celebrated science, was known for his sense of humor. Long-time "Simpsons" showrunner Al Jean also posted a tribute to the physicist, noting that he had "a sense of humor as vast as the universe." HuffPost reporter Ashley Feinberg also recalled his sense of humor. "One of my favorite things about Stephen Hawking is that he was mean to all the right people," she posted, along with text recounting how he would "enjoy running over the toes of people he didn't like," with his wheelchair, including an anecdote of allegedly doing exactly that to Prince Charles. Citing a biography of the scientist, the passage added that "one of Hawking's regrets in life was not having an opportunity to run over (former British Prime Minister) Margaret Thatcher's toes." Egyptologist, TED speaker and "space archaeologist" Sarah Parcak recalled that one encounter between the two almost came to a messy end. "I nearly killed him, and he me, 15 years ago, when his wheelchair shot out between two parked cars at Cambridge, and I was on my bike," she tweeted. "I swerved at the last moment. 100% his fault. God bless you and RIP." The Planetary Society, referencing a famous quote from popular astrophysicist Carl Sagan, posted a photo of Hawking alongside Society members. "Goodbye, Dr. Hawking. Thank you for sharing your beautiful mind with this pale blue dot," it said. Other fans simply posted their favorite images of the scientist, including Hollywood Reporter writer Seth Abramovitch, who tweeted a photo of Hawking weightless in a reduced gravity aircraft, a beatific smile on his face. Alongside the image he posted, simply, "live your dreams!" Tanya Harrison, "Professional Martian" and director of research at ASU's Space Technology and Science, recalled what an inspiration Hawking was to her growing up, especially given his disability -- he suffered from ALS for over five decades.